We are a dynamic company that create photo collages in digital media. Photo Collage is an excellent gift or present for almost every occasion or event like wedding, birthday, anniversary, travel experience, retirement, commemoration, career, family generations, etc. 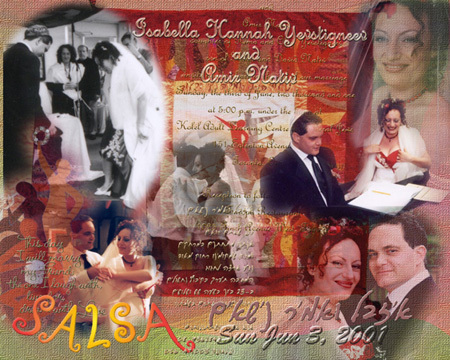 With your selected photographs, text and other information (wedding invitation, names, dates, logos, etc) we create affordable visual harmony of "All in one picture" (Collage) with single or multi colored, sepia or black & white and with texture background, see sample below and Gallery. Selected photos and invitation were provided by the customer, they were scanned and the originals were mailed back to the customer with the final collage and additional prints .